In the eighth inning of a one run game last night Tigers fans decided it was a good time to do the wave. While you watch this clip of Ryan Raburn’s home run (seriously MLB, why can’t these be embedded yet?) that inning notice the people sitting behind the plate. There are only two people watching the game at that point. Everyone else is watching the wave as it had passed behind home just a second earlier. The heads snapping around to the game action after the hit had to leave a couple people with a nasty case of whiplash. Ryan Raburn is hitting .227/.266/.387 on the season so I get that his at bats could be hard to watch. But when you’re doing or watching the wave instead of watching the game you never know what you’re going to miss or cause other people around you to miss. 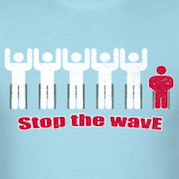 This entry was posted in Stop The Wave. Bookmark the permalink.